On 13th of February 2015, Blitz Technology performed, together with its trustful partner MVCOM, the company’s first ever Internet Live broadcasting. The broadcasting was made with the occasion of celebrating 7 years from launching the WeInvent blog by the MVCOM Managing Partner, Marian Costache. 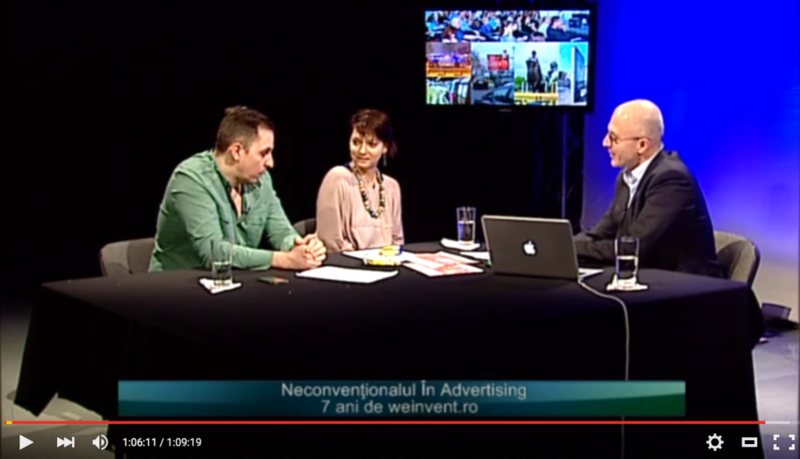 The subject of the transmission was an one hour talk show moderated by Marian, who interviewed two of the industry experts, Monica Magureanu, Managing Partner Pandorra Business Management, and Razvan Matasel, Managing Partner Arsenoaiei & Matasel, about the current state and the future of unconventional advertising in Romania. Blitz Technology acted as an integrator for this event, taking care, together with its partners, about the provision and integration of production and transmission resources needed for the transmission. Special thanks to the companies Studio Video Art, Marbo Trade, Digital Media Engineering and Mediasat for their support throughout the preparation and live stages of the event.